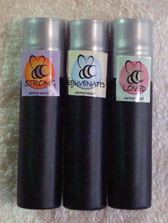 O2 Innovations® has created 13 aromatherapy blends for their O2-B® Personal Oxygen Bar. Click Here to Read More About Aromatherapy. Order all 13 - 1 Dram bottles to start off each day with a different feeling. If you are in the mood to be playful try some Bee Youthful with your O2-B. If you want to wind down after a hard day at the office, a drop of Bee Relaxed will do the trick. Choose your favorite today. Please refer to your O2-B® Personal Oxygen Bar Owner's Manual for instructions and safety guidelines before using any aromatherapy. Remember. . . add less than one drop of these highly concentrated, all natural, plant-based, esstential blends to your O2-B Personal Oxygen Bar's mouthpiece filter to enhance your breathing experience.